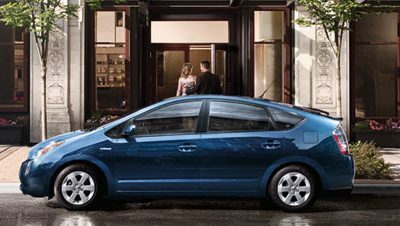 Hybrid Car – More Fun with Less Gas » Blog Archive 2008 Prius - what's new? Another change is more of a marketing change rather than anything technical – Toyota has introduced an even more stripped to the bones package that made it possible to drop the base price to $20,950 from $22,175 in 2007. Note that you will have to part with the beloved Smart Key system (along with cruise control). Cruise control I can live without but Smart Key? This is an amazing convenience tool, I cannot imaging getting in a car without one after just one year of using it. I guess, no stripped-down package for me… Anyways, Toyota is also marketing the “ECO-nomic Savings Bonus” of $600 to $2000 with purchase of a 2008 Prius but you will have to check with your local dealer to see what it actually means dollar-wise. It looks like a comparatively optioned 2008 Prius will cost you about $1000 less than it did in 2007 for essentially the same vehicle. Lucky ducks! Of course on the sticker of the 2008 model you will see the EPA mileage estimates slashed down to 48mpg city/ 45mpg highway vs. 2007 estimates in 60 city/52 highway. It’s kind of mildly funny that the estimates look like your worst case scenario now. My summer driving (50/50 city/highway) was consistently at 52mpg. Also, last winter (time of generally lower MPG) I took the Prius down to Florida and back (2100 miles round trip) and saw 48 MPG all the way through. All in all, 2008 Prius looks like a continuation of the same great theme but I am saving some money for the 2009 model that promises some arguably radical new features. This entry was posted on Monday, November 26th, 2007 at 8:38 pm	and is filed under Toyota Prius. You can follow any responses to this entry through the RSS 2.0 feed. You can leave a response, or trackback from your own site. I bought a 2008 Prius after renting a 2007 for a week. Both had halogen headlights, (not the HID option) but the 2007 had a reflector that put a annoyingly bright beam in any oncoming pedestrians (on the sidewalk) eyes, as well as the side mirror of any car you passed. Often I could see people shielding the mirror with their hand when I drove to the left of them. (don’t pass slowly, it only makes it worse) I taped the top third or so of the headlight up with blue masking tape to reduce the beam to make me be less of a offensive jerk. At night it’s not too hard to figure just where the tape has to be. Happily, they seem to have changed that in the 2008. It has a normal not too bright beam pattern that still lights up street signs enough. Wish I could share a picture I made last May,07. While northbound in the middle of Iowa I was getting an average of 49 mpg for 293 miles. The graphic on the dashboard showed that the up and down of the expressway showed over 60 and down to 45 mpg at the five minute intervels! Considering I was flying right along it amazed me, I knew it was good but didn’t know it would do that for me.